Vasai has demonstrated religious harmony throughout its history. Having been under Portuguese rule for a long period, Vasai has significant Portuguese cultural influence. Vasai, which is not same as Sopara or Shurparak but rather a superset of it, has five rivers. Two of them, namely Vairarini in the North and Ulhas in the South, mark Shurparak’s limits. These rivers form the Vaitarna Creek and the Ulhas or Vasai Creek respectively. Three small rivers named “Pandu Nadi”, “Preta Nadi” and “Gaarudi Nadi” run off the Tungar Hills and meet the sea through the land of Shurparak, forming the Bolinj Creek, Sopara Creek and Vagholi Creek. All of these creeks are now drying off. Bajipur, the original name of Vasai as it appears in Padma Purana, which was later restored during the rule of the Peshwas (hence Bajipur is often erroneously thought to have been named after Bajirav Peshwa). The Harivansha Purana’s Vishnu Parva Chapter 39, Verse 28, and Chapter 40, Verse 39, mentions “Shurparak” to be a city 500 bows wide and 500 arrows long (Note: Bows and Arrows were the early Hindu Units of Breadth and Length). According to Buddhist monks, in one of his former births, Gautama Buddha was Bodhisat Supparak, that is Bodhisattva of Shurparaka (Sopara). The Yadava Kosha also mentions “Shurparaka” as one of the chief places in Aparanta. The eighth edict of Ashoka shows that Shurparaka was the capital of Aparanta. The name “Vasai” appears on stone inscriptions in the Kanheri Cave writings and as "Vasya" in the Karla Cave inscriptions. Vasai is mentioned as “Bussy” in Ain-I-Akbari Ch. II-66, of Abu Fazal. It is called “Baxay” in Barbosa (Pg. No. 68). Finally, after Indian independence, it was renamed as Vasai. Sopara had maritime links which has been attested even by Masudi, Ibn Haukal and Al Beruni between the 9th and the 11th century. People from various faiths and countries used to come to Bharat for higher studies in Philosophy, Medicine, Astronomy, Engineering, Music, Art etc. Thus they used to visit “Surparaks” too, which was once a great center of Indian Wisdom. Thus we find mention of “Surparak” in Bible too where many persons mentioned in Old Testament came to acquire knowledge and information. Thus, Sopara is referred in the Old Testament as Ophir, the place from which King Solomon brought gold; 1 Kings 9:28, 10:11. Cf. Psalms 45:9, Isaiah 13:12. Josephus identifies Ophir with Aurea Chersonesus, belonging to India (Antiquities 8:6:4). Septuagint translates Ophir as Sophia which is in fact kalyan and not sopara, which is Coptic for India. This refers to the ancient city of Soupara or Ouppara on the western coast of India. Vasai was the seat of the various political powers namely Guhashayas, Mauryas, Sudhanva, Guptas, Satvahanas, Shilahaaras, Yadavs, Moghul, Portuguese, Marathas, British, Union of India (Since 1947 called Free India). Vasai boomed as a seat of knowledge where students and scholars from as far as Europe came to learn and also propagate their philosophy. It was trade center for spices, grains, sugar, and the ship building industry. The salubrious climate and the burgeoning profits saw many wealthy merchants in the Buddhist rule and fidalgosin the Portuguese rule ; blue blooded Portuguese nobles resided here in lavish villas. It later became the town where the Portuguese aristocracy sent their illegitimate sons rather than exhibit their illegitimate offspring. The floor of St Francis Church is paved with the graves of the Portuguese nobility along with their royal insignia. Vasai has always been the largest contributor of scholars for the Vedic Religion who work in potato farms, Jain-Buddhist sects and priests to the Bombay Archdiocese. This place is a place known for the one of the four famous sarovars, Nirmal Sarovar of Vedic religion(none of the vedas refer to nirmal), called Mahasmashan during times of Lord Parashurama, it was one of the 84 Gacchas of Jains, it was the centre of learning for the Maitreya Buddhist sect, the sacred place with 3 tombs each of 5th, 7th and 38th Jagadguru Shankaracharyas namely Vidyaranya Swami, Padmanabha Tirtha Swami, and Narayan Upendra Swami. The diocese has also contributed India's First Catholic saint St. Gonsalo Garcia. Around 3000 B.C. – Pandavas visit Shurparak (Sopara) on their way to Prabhas, they halted at a place where a well was built centuries ago, now this is located in place called Pandav Vihir at Chulne Gaon. Around 2000 B.C. – Utkala (ancient Orissa) Naresh Guhashaya of Chandra i.e. Somavanshi Kshatriya clan ruled Shurparak. Around 1700 B.C. – Shripaala charita chapter III mentions, King Mahaasena rules Sopara and his daughter Tilaksundari married King Shripaala. During this period Sopara’s Buddhist Stupa (Burud Raja’s Mound) where the present day sopara Hindu temple stands after demolishing the buddhist place of worship . Here murders used to be held on the banks of Nirmal sarovar among the scholars from the Gacchas and Vedic Scholars attached to the Vilameshwar temple established by Lord Parashuraama. Suppara Jataka, believed to be of 6th century B.C., talks of Sopara as a prosperous port trading with ports of Southwest Asia, Gujarat, Malabar and Sri Lanka, its experts (navigation pilots- bodhisattvas), and the seas that they voyaged across but latter it was abandoned since the people of sopara were forced to give up their valuable Buddhist teachings to follow Hinduism which prohibited them from going overseas as sea was considered God by brahmins. Around 500 B.C. – Burud Raja, a great Dharmic raja rules Sopara. The timing is questionable. The famous historian Bhagwanlan Indarji, in 1882 excavated an ancient site near an old stup near Nirmal which was known as Burud Rajacha Kot. He recovered relics pertaining to Lord Buddha. The relics are now with the Asiatic Society of Mumbai. Around 268-232 B.C. – Rule of Ashok Maurya starts. Fragement of Ashok's Stone Edicts were found from the same area. The fragments of VIIth and IXth major stone edicts were found and can be viewed at Chhatrapati Shivaji Maharaj Vaastu Sangrahalay (Earlier known as Prince of Wales Museum). In 1956, a fragment of XIth major rock edict was found from a coastal village, Bhui. It is learnt that communication links between central and Northern India was re-established through trade routes by the effort of Emperor Ashok. Two main trade routes connected Maharashtra with North India. One such route linked Sopara to Ujjain via Nasik, Pitalkhora, Ajanta and Maheshwar. The clue to trade routes is provided by the location of early rock-cut caves situated along ancient roads. 56 B.C. – Samrat Vikramadatya, the Great of Ujjain obtains Shurparak and obtains one of the Panchadands. During his period to the rajya of Shurparak remains under the hands of Saatavanah Kings, loyal to Samrat Vikramaditya. Their names Simruk, Krishna, Shatakarni Purnotsanga , Skandasthambi, etc. Around 90 A.D. – Gautamiputra Shatakarni establishes his rule over the western strip of India including Shurpaaraka. A silver coin was found along with Buddha relics by Bhagwanlal Inderjee. defeating the Nahapan kings and reestablishing the yajnya culture from vedic dharma. His rule marked the crest jewel in the history of Satavahan kings. His rule saw skillful masons, coppersmiths and goldsmiths. The present hamlets of the “Kasar and Sonar people” in Sopara belong to this period. Around 120 A.D. – Satavahan ruler Rishabha Datta ruled this region which finds its mention in the edict at the 10th cave in Nashik. Around 400 A.D. – 500 A.D. – Shurparak goes into the hands of Trikutaka Empire. During this period three Trikutaka rajas ruled Shurparaka successively viz. Indradatta, Dahrasen and Vyaghrasen. 700 A.D. – Adi Shankaracharya, the greatest Acharya or Cardinal religious leader of Hindus, arrives in Shurparak on Kartik Shukla Trayodashi enroute from Gokarna to Saurashtra. Stays at Vimaleshwar Mandir, whereas Sureshwaracharya , His disciple stays on other banks of Vimala Sarovar where he establishes the Shivalingam. Around 850 A.D. – Dridhaprahaara Yadav rules. Around 900 A.D. – Seunachandra (I) Yadav and then Dvaadiyappa Yadav rules. Around 916 A.D.– Bhillam (I) Yadav rules. Here starts relationship with the Shilaahaara Kings, with the marriage of Bhillam Yadav with Lashtiyavva the daughter of King Shilahaara Jhanjha. Around 1017 A.D. – King Aarakeswar Shilahaar rules Shurparak. Around 1030 A.D. – 1069 A.D. – Yadav Seunachandra (II) of Somvanshi clan ruled Shurparak including Vasai. His raajaguru was Sarvadevaachaarya. On his commands Bimba Yadav rules Shurparak. Here the name of village “Chincholi” appears. “Sonaarbhat”, a colony of skilled Sonar’s (goldsmiths) find first mention in this period. 1072 A.D. – Rule of Shri Haripaala Shilahaara. A great religious congregation of Vedic Religion was conducted at Shurparak and various scholars from different parts of Bharat Varsha (Undivided Hindustan) were honoured and many of them were requested to stay at Shurparak. Sri Haripaala Shilahaara donates a fruit orchard at village Ranjali to great scholar Vishnu Upadhyay who was a Kanyakubja Brahmin. He was such a great scholar that in 1059 A.D. a donation of 10 Drammas (the currency of Eastern India) was donated to Him for his noble activities like running Veda Patha Shala. The Mahapradhan Ahamalladev donates the revenue of Ane Wadi to a scholar Brahmadeva Deva Bhatta. During this eccassion Vasudev Padwal, Mahapradhan Padmashiva Raul, and Pradhan Vasugi Nayak were present. Here we find the name of Vattaaraka modern day name Vatar. Here during the religious congregation various lands were donated by Raja Haripaala to many Brahmins of various branches, thus the 12 villages around this Vattaraka were given to Brahman Scholars many of them Rigvedi, Yajurvedi, Saamavedi and Atharvavedis. But these Brahmins later during the crises went away in the Vatodara region and Nasik region only to leave behind some of their traces which later faced conversions from Portuguese and intercaste marriages and inter gotra marriages with the local Kshatriyas, Agris and Koli clans. Thus during the Portuguese all this region was depleted with pure Brahmin society. Around 1138 A.D. – King Pratap Bimba Chalukya, brother of Govardhan Bimba raids Shurparak from northern side of Vaitarana. Captures Shurparak and remakes the old city of Mahikavati i.e. Kelve Mahim. His empire extends from Daman to Valukeshwar (Walkeshwar). Around 1148 A.D. – Pratap Bimba Chalukya dies in 1147 A.D., Mahi Bimba ascends to throne of Mahikavati (Mahim).Taking advantage of new power, Krupal Shilahaara captures back Shurparak, but his boundaries remain limited to Shurparak, i.e. from North coast of river Ulhas to the southern bank of famous Vaitarni River. Around 1160 A.D. – Aparaditya Shilahaara attacks Sopara and arrests Mahi Bimba from Pratap Bimba’s family and keeps him in the prison of Sashti. According to the treaty Mahi Bimba leaves claim from Daman to Dahisar and hands over this land to Aparaditya Shilahaara. Pratap Bimba (II), son of Mahi Bimba now establishes new Mahim in Mumbai and rules there till 1267 A.D.
Around 1161 A.D. – King Mallikarjuna Chandra Dev rules Vasai. His colleagues being Prabhakara Nayak, Paadhi Anant, Devshiv Rajguru and Shaivaite Temple Priest Bhopa Dharmashiva and Avajha Upadhyay Laakhnak. Here it should be noted that all the above names belong to Eastern India. The name Mallikaarjuna is very common in the Rajmahendri (Rajmundri) district of Andhra. The surnames Nayak, Paadhi, Raajguru, Bhopa, Avajha Upadhyay all are the names very common even now in Orissa. All these names are taken from the inscribed stone obtained from Sopara and now kept safely in Royal Asiatic Society Mumbai. Here we get the mention of three names of places in old Shurparak namely “Shilaarvaavak”,”Padhaalasak”, “Katkhadi”.General Ambud, a Somavanshi Kshatriya from Gujarat, from Anhilvaad, whose lineage runs back to orissa somavanshis, tried to attack Mallikarjun Shilahaar and for this settles near Dahanuka river (Dahanu).At the same time Mohamedeans attack Anhilvaad and thus the somavanshi sena stays near Dahanuka .They help Yadavs to conquer North Konkan and defeat Shilahaaras. In return Yadavs accommodate these Somavanshi kshatriyas in Dahanu. Around 1161 A.D. – 1195 A.D. – Aparaditya Shilaahaara rules Vasai. He was called “Maharaajaadhiraaja Konkana Chakravarti”.Here during this times we find names of villages “Saatuli” (Now Sativli), “Nandui” and name of Brahmin named Vedaanggraasi. Shilaaharas rule Shurparak. Ambassador of Shilahaar King Aparaditya, named “Tejakantha” defeats the scholars of other faiths in a grand debate organized at Shurparak and then Aparaditya had honour of sending the Shurparak delegate Tejkantha to literary conference at Shardi in Kashmir for further proving his scholarship. There a mention of his visit to Shankaracharya Hill in Srinagar to receive blessings are found in the Kashmiri records. There he visits the relatives of Kashmiri Brahmins at Sri Nagar whose relatives were settled at Vasai. Even today the Brahmins of Vasai with surname Pandit who are locals, claim themselves to be descendants of Kashmiri Brahmins. 1195 A.D. – 1232 A.D. – Keshiraaja Shilahaara rules Sopara. He was also called “Maharaajaadhiraaja Konkana Chakravarti”. During his rule, his feudal Raja Anurodha ruled Shurparak. During this period a great saga of Bimbadev Rana starts at Shurparak. Bimbadev Rana, was the illustrious son of Kanauj Vidyapur’s King Shankardev Rana and Devi Mankoji Bai. After Shankardev, the step brother of Bimbadev named Mahipaal Rana ascends the throne by backing of the Mohamedeans, though Bimbadev was original heir of Shankardev. Thus Mankojbai leaves Kannauj with her son Bimbadev Rana, gets help from her brother Hedurao and King of Sorat Ankush Rana (whose nation was also facing Mohamedean wrath). All these came to Devgiri to meet illustrious Ramdevraya. Seeing the valour of Bimbadev Rana, Ramdev hands over the kingdom of Paithan to Bimbadev as his feudal. Bimbadev acquires fame for his able administrative skills. But at the same time, an innocent Brahman was killed by Ramdevrao. This act was condemned by the regional Kings. Even Bimbadev Rana who had highest regard for the meritorious Brahmins now refused to remain as feud of such a King. In such a religious dilemma now Ramdevrav got some support from the “Patane Prabhu” community and some “Palshi Clan”, and using the support of these people he continued his kingdom. Seeing this, Bimbadev Rana preferred to leave Paithan and ascend towards Konkana and defeated King Anurodha, feud of Shilahaar on the place of confluence of River Vaitarana and Sindhu Sagara. During this campaign Raja Bimbadev Rana got support from the old Gujarati Somavanshi Kshatriya friends of Hedurav and Raja Ankush Rana, who had settled in Sopara about a century ago. After this campaign, Bimbadev donated 66 villages to his 66 Sardars and this was none other than the “Sasti” island. He honoured the Brahmins here and felicitated Somvanshi heads namely Thakur, Raut, Chaudhari, Mahapatra (Mhatre), Save (Saave) and Gharat. He also honours and released orders in 1204 A.D. that the somavansha kshatriyas are eligible to use “Chattra Sinhasana and 5 Kalashas”. Thus since 1204 A.D. these Somavanshi Kshatriya clan (Both from Orissa Somavanshi clan who had settled in Shurparak in 280 A.D. and Gujarati Somavanshi clan) come to be known as “Panchkalshis”. But his kingdom does not last long, after his death Shilahaaras took over Shurparak. 1233 A.D. – Rule of Ramachandra Dev Shilahaar starts. The head of Konkan was I (Vi)shwar Dev and head of Shurparak Pranta was Kanher Dev, who was born by the grace of Kanher Dev Shiv Mandir located in Krishnagiri (Kanheri) Caves. 1255 A.D. – Rule of Jetugi Dev Shilahaar Konkana Chakravarti starts. His ministers were Shri Udayiprabhu, Maayi Naayaka (from Orissa), Daada Prabhu, Jasami Naayaka (From Orissa). A great astrologer of International fame named Shri Khidev (from Orissa) resided in Nivayi Garden in Sandor, Vasai during these times. During this period a Raajapatha (Royal Road) was built in Sopara passing through Nirmal. Here at Sandor the Shilahaara Kings renovated the Revatirtha Mahadev and installed a Nandi there. This place is now called “Relbav”. 1290 A.D. – Rule of Yadavs of Somavanshi Clan of Eastern India, thus they carry in their names the title “Chandra Dev”. King Iyarandev and later King Naarandev rule Shurparak for a short time. 1294 A.D. – Bhimdev Yadav starts rule over Shurparak and Mahikavati. He established Suryavanshis and Sesha Vanshis in Mahim and Shurparak. Bhimdev also brought Agales (i.e. Agris) from Mungi Paithan in Paithan District on banks of Godavari, who work as Patharvat (Road Makers), Mithagre (Working on Salt Pans). In Portuguese rule Agaris were forced to work as sanitary cleaners by Portuguese. Agris are considered to be clan originating from a Kshatriya Prince Yayati and his maid servant (dasi) Aagalika. Bhimdev Yadav gave a new look to the city of Shurparak. The city comes to a new repute from the educational and cultural point of view. Bhimdev Raja invited 101st Jagadguru Shankaracharya Swami Sukhabodha Tirtha to Shurparak around 1296 A.D. and requested a dharmic justice to purify Anhilvaad Somvanshis assisting them to take Prayashchitta about the abhakshya bhakshana (about eating flesh of horse) during the war with the Mumbai Somvanshis and Mohamedeans. 1350 A.D. – Internal conflict starts between descendants of Bhimdev and Seshvanshi’s. The Somavanshis of Anhilvad assist Seshavanshis and defeat Yadav dynasty. Survanshis flee to Sashti and Chaul. Now Shurparak goes into hands of Seshvanshis with only three clans of kshatriyas left namely Anhilvaad (now called vaadval) Somavanshi Kshatriyas, Seshavanshi Kshatriyas and Chaukalshi Kshatriyas. 1394 A.D. – 1414 A.D. – Rule of Natharao Sinda Bhedari- Bhongle from Sheshavanshi Kshatriya Clan. He was the first king to build the Vasai Fort. Vasai was called Bajipur in the Puranic Records. (Bajipur is original name of Vasai, as mentioned in Padma Purana, but people mistake it to be named after Bajirav Peshwa. 1414 A.D. – 1507 A.D. – The political crisis reign the Shurparak and Mahikavati with clashes between Somavanshis, who now called themselves Paanch Kalshis and Seshavanshis. Thus Shurparak becomes very weak politically. This period was most tragic for India since, during this period, the west coast of India had practically no ruler at all, and this news spread out as far as Europe. Now European empires sent off their voyagers to discover the possibility of rule in India. At the same time, Mohammedeans prepare themselves to take advantage of this weak rule. Sultans of Gujarat continuously raid Vasai under leadership of Mahmud Begada, and ultimately in 1513 A.D. Mirat-I-Ahmadi mentions the hold of Mahmud Begada till 1517 A.D. Sultan Bahadur Shah of Gujarat and foe of Humayun, hold Vasai since 1517 A.D. and start heavy destructions between 1513 – 1530 of Stone Temples of Hindus and Burud Raja’s Palace, destroy stone lined “Tirtha Sthalas “Lakes and reservoirs. Now Bahadur Shah from Gujrat had complete hold over Vasai. Portuguese pirates of Goa and the local chieftains raided vasai as and after the rule of sultans started weakening fighting mughals. Vasai was burnt twice by Portuguese. Mosques, which were built on Temples were destroyed and new churches were built on them. Now the town was called Baxay. It was filled with the men of Bahadur, who were Moors (Muslims of mixed Arab and Berber descent). (Ref. Jordanus’ Mirabilia Pg. 23). These pirates started merchandise exchange and started great movement of shipping from Malabar laden with arecas, cocoa and spices, which were later, sent along Red Sea. 1526 A.D. – Portuguese establish the first factory. 1529 A.D. – Heitor da Silveira attacks Ali Shah - burns and plunders Vasai. Mosques which were built on temples were destroyed. New Churches were built on destroyed mosques. Religious Conversions starts under guidance of hoary Franciscan missionary Fr.António de Porto who are helped by the orthodoxy of local Hindus. 1532 A.D. – Governor of Diu Malik Tokan of Bahadur Shah re-fortifies Vasai. Establishes 15000 Cavalry and Infantary. 1533 A.D. – Portuguese General Nuno da Cunha along with Diogo de Silveira and Manuel de Macedo bring 150 Ship – 4000 men (half Europeans, Half Goanese) and attack Vasai. Bahadur Shah cedes Vasai. Religious Conversions restart under guidance of hoary Franciscan missionary Fr.António de Porto who throws bread in the well and those who drink water from that well are automatically ostracized from Hinduism by shamedi brahmins who donot hesitate to confisticate the lands and belongings of the converted before ostracizing their people (citation is required). Thus the rule of King of Portugal João III starts. It should be noted that he is that King of Portugal at whose request Inquisition formally started in Portugal but not in India. 1536 A.D. – António Galvano opposes muslim attack on Vasai, lays foundation corner stone for the reconstruction of Bacaim Fort. 1537 A.D. – António Galvano furiously pulls down certain Muslim Mosques which were built on the foundation of hindu temples and in their place builds Cathedral of St. Joseph. Portuguese empire seemed to favour the Franciscans. Though this continued till 1634 A.D., but due to the changes in the Papal intimacy towards Jesuits (famously called Troops of Pope), Portuguese empire had to allow them in Bassein too. 1539 A.D. – Muslims see this act as danger to Islam in this region and calls “Jehad” and pray to muslim rulers. 1542 A.D. – 1580 A.D. – Clergymen under guidance of fathers of Jesuit College start conversions of natives into Christianity by preaching’s and throwing breads in the wells which according to orthodox Brahman belief become unholy to drink so anyone who drinks the water is ostracized and declared converted . Basically Portuguese backed Franciscans. Immediately at the advent of Portuguese rule, the Jesuit missionary of zeal Francis Xavier from Spain, arrive in Vasai in 1544 A.D., and twice in 1548 A.D. and train the pastors for Evangelisation of the true faith. Francis Xavier is famous for his quotation, “ Every time a new convert smashes his idol and caste, my joy knew no bounds”. Soon the Portuguese stripped lake banks pulled down around 200 temples and used the stones in building Portuguese Churches, forts and houses, religious and state buildings whose ruins still remain in Bassein. 1583 A.D. – Bacaim becomes full fledged trade centre with trade of rice, corn and timber for ship building. St. Joseph Cathredal construction completes, 5 Convents, 13 Churches, an orphanage and a hospital built in the city of Bacaim which was never done during the brahmin rule. Of which Dominican Church was built in the Fort under the invocation of São Gonçalo. Jesuits intensify their evangelization movement to increase support against invaders of other faiths and to increase the number of Catholics as against Protestants. (this is funny where did the Protestants come into picture ? ), which were on rise in Europe. The methods adopted for conversions were numerous, which is clear from the “Monita Secreta” which reveal “Secret Instructions of the Jesuits”, Jesuit way of missionary work is also revealed from the fact that in 1738, English rulers at Bombay have observed Jesuits to be hostile and treacherous since they tie up with peshwa a brahmin ruler and shamedis and take control of whole of India technically the shamedis are responsible for British rule of India. 1607 A.D. – Bacaim gets international acclaim to be place of Shipbuilding, place of export of building stone; (these stones are used to construct all Goanese Churches). 1612 A.D. – Muslims besiege Bacaim but fail considerably. 1618 A.D. – 1634 A.D. – Portuguese give conversions a slow down and start maintaining good relations with native unconverts to avoid conflicts, curses and thus grow their trade in rice, pulses, grains and cocoanuts. They allow 200 native Christians to stay within the walls of Bacaim along with better class of Christians. Though craftsmen and Hindu Brahmins were not allowed to live within the walls . The Jesuit college gets reformed with fine library of commentaries, works on history and morals, increase hospitality and made public places of entertainment unnecessary. 674 A.D. – 600 Arab pirates from Muscat landed at Bacaim and plundered all churches outside of the walls and did cruel violence on native converts and unconverts. This marked the decay of Portuguese power. These Arabs settled in the now what is called as “Hathi Mohalla “ and later spread in Papdy. Seeing this as right opportunity, Shivaji recommends More Pandit to settle in Kalyan and forced Portuguese to pay one forth of Bacaims revenue. 1693 A.D. – Jagadguru Shankaracharya Narayan Upendra Swami of Jyotish Peetham arrive in Vasai during his onward journey from Rameshwaram back to Jyotishpeetham. This is located in the open ground near “Sureshwar Mandir”. 1702 A.D. – The economic crises in London adversely affect the trade from Vasai. 1728 A.D. – Portuguese Officer sent from Goa observes that outposts, stockades, forts and grassion of Bacaim was in poor state with only unskilled and untaught and undrilled robber like soldiers left in the fort. Portuguese take strong steps to restructure the Bacaim’s administrative structure. 1737 A.D. – 38 A.D. – *1737 A.D. – 1738 A.D. – Marathas march towards Bacaim. They seize Arnala to drive out the Portguese. General Shankarji Pant informed Chimaji that Arnala fort is a strategic FORT for the naval forces that were on route to attack the Portuguese. Chimaji approved the assault on the fort. Shankarji Pant consulted and sought assistance of the local people to attack the Arnala fort; among them were Govindji Kasar and Gavraji Patil from Bolinj. Shankarji sent Gangaji Naik, Bajirao Belose and Rayajirao Surve to lead a battalion of 400 soldiers to lead the attack on Arnala fort. This attack was coordinated along with naval force commanded by Manaji Agre. On March 28, 1737 Maratha forces attacked the fort and surprised the Portuguese who were caught with their guard down. The Portuguese retreated and gave up the fort. The Maratha victory was commemorated with a plaque installed on the northern wall of the fort and is still visible today. Soon after the Maratha victory, Shankarji Pant began reconstruction of the fort. By January of 1738 three bastions were completed. The three bastions were named Bahirav, Bhavani and Bava. The construcation was completed by March of 1738. Later Marathas occupied Versova and Dharavi. 1739 A.D. – Seize of Bacaim begins on 17 th February 1739 under able leadership of Bajirao’s brother Chimnaji Appa. Marathas exhibit besiegning force, skill, courage and perseverance and thus Portuguese lose their commander Silveira de Menezes. But Portuguese Garrison defends with highest courage and constancy with hand grenades, musketry and mortars, using their technically advanced weapons and artillery, the Portuguese inflicted high casaulties on the Marathas . Angre’s fleet plays brave role and on 16 May 1739 Marathas defeated Portuguese with might. Portuguese offered to capitulate, but requested to allow marching out with honours which Marathas accepted, as a mark of humane protocol to the defeated army. Bacaim fell from Portuguese as a stately tree never to rise again. 1739 A.D. – Bacaim was named as Bajipur after the peswa Bajirao. To restore the Hindu Culture and resettle the unconverted natives they incurred upon by the Portuguese Rule, Peshwas brought a flight of well trained, well learned Brahmans to purify the native converts willing to reconvert to their original Hindu fold of four castes and made them fit to take their place in their old castes. To the converts unwilling to come back to Hindu Fold or to those who were born out of Portuguese Peshwas striped the churches it was latter in 1800s that these churches were reconstructed during the British rule of India. Chimnaji Appa restores the Nageshwar Mandir near Naga Kunda, Builds Hanuman Mandir over a church which might have been built on a mosque or temple foundation in the Fort . And oldest Trivikram Mandir in Fort over st. anthony churchand Vamana Mandir of Aggasi said to have been established by Shri Vamadev Tirtha Swami in 388 B.C. built Bhavani Shankara Mandir of Aggasi over our lady of light church, Papdy Kshetrapaleshwar Mandir which was built over our lady of fatima . Also rebuilt and restored Jagadguru Shankaracharya Mandir at Nirmal. Also reestablish the Padmanabha Tirtha Swami Samadhi Ruins on the outskirts which were destroyed by Portuguese. Shankarji Keshav , the Subhedaar of Vasai took lead in all these activities. 1767 A.D. – Dutch wished to establish the factory at Bassein. 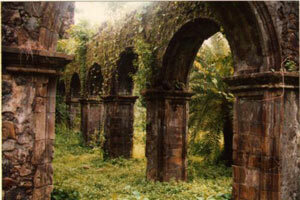 1774 A.D. – The Bassein town was taken by British but was again restored to the Marathas. 1780 A.D. – British led by Godrad attacked Vasai from 13 November to 10 December and acquired Vasai from the Marathas. 1783 A.D. – Under the treaty of Salbai (March 1782) Bassein was restored to Marathas. 1802 A.D. – 31 December, the Treaty of Bassein was concluded. 1830 A.D. – British attempted to revive the industry in Bassein by starting the Sugar Factory, but the scheme failed from the death of Mr. Lingard the promoter. 1838 A.D. – Bassein almost became deserted with just a small population of fishermen, hunters, native converted and native unconverted ones. The population dropped down from 60499 in the beginning of 1802 A.D. to 10356 in 1881 A.D.
1852 A.D. – The ruined Portuguese Church of Nossa Senhora da Vida was converted by British to a sugar factory. But the factory was soon closed due to losses incurred because of poor administration. 1856 A.D. –Road was built connecting Bassein to Manickpur (Umela). 1860 A.D. – The land of the fort was leased for thirty years to Major Littlewood, whose son cultaved the fields in the fort for some time. Franciscan Church was closed by bastion of Sam Sebastian under the pressure of British and Mrs Littlewood. 1864 A.D. – Bassein Municipality was established. A new town beside Par Naka was established in the village of Malonde. The Bassein Municipality limit included Old Fort, Malonde, Dhauli, Sandore, Mulgaon and many gardens and fields between Bassein and Papdy. 1869 A.D. – Mamlatdaar Office gets established. 1947 A.D. – British Rule Vasai. 1947 A.D. onwards – Rule of Union Government of India rule Vasai from New Delhi by the democratically elected representatives.